Retro dress with sweet pink polka dots and statement accessories. The wind is in a playful mood today, just like me. 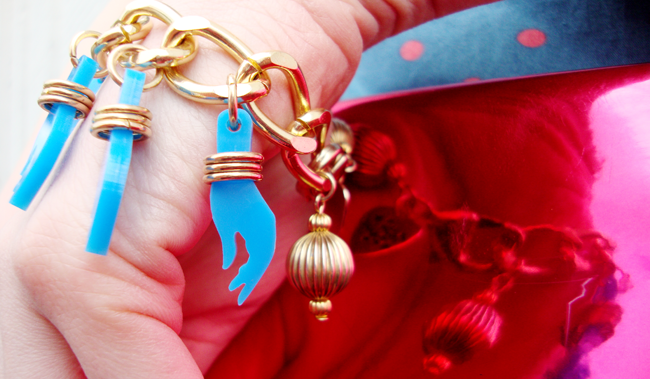 Goddess hands jewellery from Tatty Devine: My finds from their last lucky dip & sample sale. The candy clutch: I'll never get tired of this handbag. It's just too awesome. I love reflections, all in blue and pink. 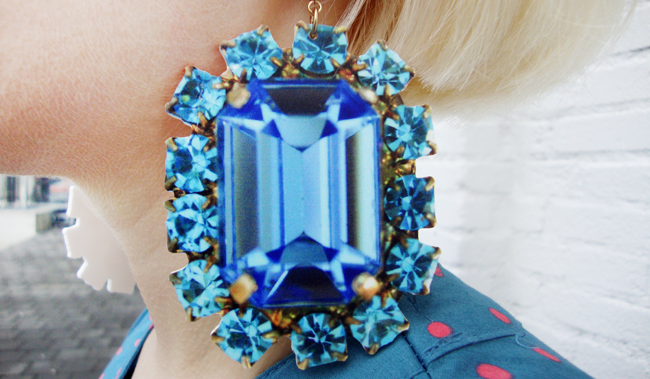 A treasure from the Tatty Devine swap store: Massive printed gemstone earrings. The biggest gems you've ever seen. Fit for a perspex queen. A little tribute to Marilyn – I didn't even need to look for a ventilation shaft. Hugging and treasuring my oversized pink candy. Sending you my kisses and hope you like my blue and pink vintage look. An easy to wear look, perfect for visiting possible parents-in-law or for other occasions you want to look like your true self (or at least appear like this is what you are): A very, very sweet and good girl. Because I love style mix, I added non-vintage-style eye-catching statement accessories like my huge Tatty Devine gemstone earrings and the iconic Maison Martin Margiela candy clutch. The wind was my good friend during the shooting, it understood my vintage look and helped me to create a true Marilyn Monroe mood with whirling skirt. Sometimes this little unplanned things are just the final touch to a look. Art loves fashion and fashion loves art back! 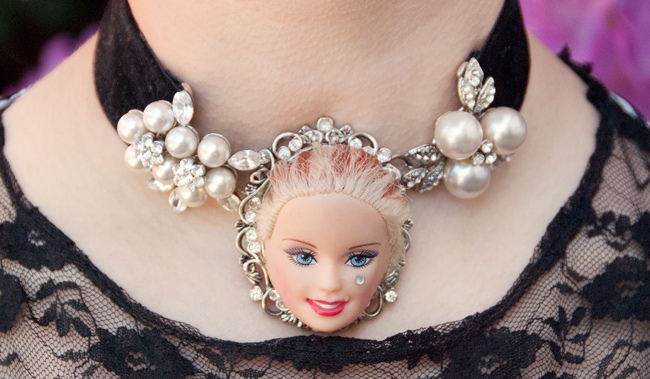 Among all the art movements, especially pop art is a never-ending inspiration for fashion. 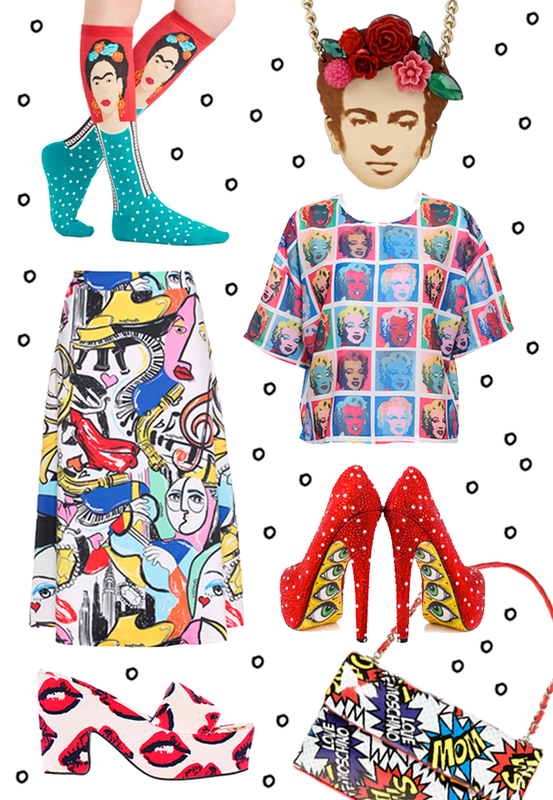 Repeating symbols in flashy colours, comic inspired prints and Warhol's Marilyn are fashion evergreens. 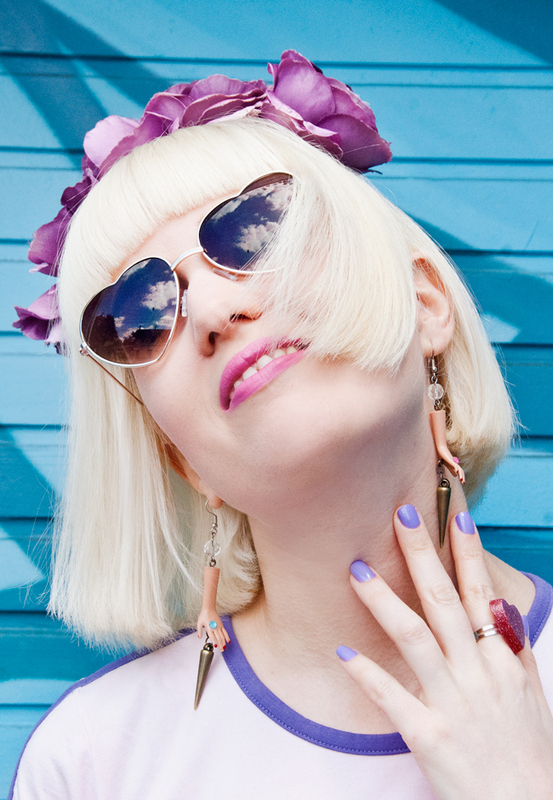 Wearing them makes you instantly feel like a pop art heroine. A little bit of art in your outfit never hurts and is perfect for a stroll through your favourite galleries or just for everyday. There is nothing such as a wrong time to turn yourself into a walking piece of art! Pop art is not really your thing? 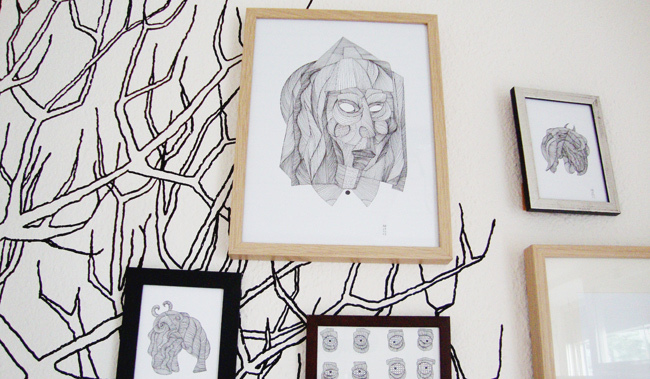 Go for Mexican surrealism then with Frida Kahlo! Her face has already been printed on thousands of T-shirts and decorates the necks of the coolest ladies. But the best Frida-themed thing I've ever seen are clearly the socks above: Definitely a must have for admirers of this fabulous woman and a must have for an arty look! How do you like those arty fashion pieces and which one is your favourite? The weird one: It's even written on my chest today. 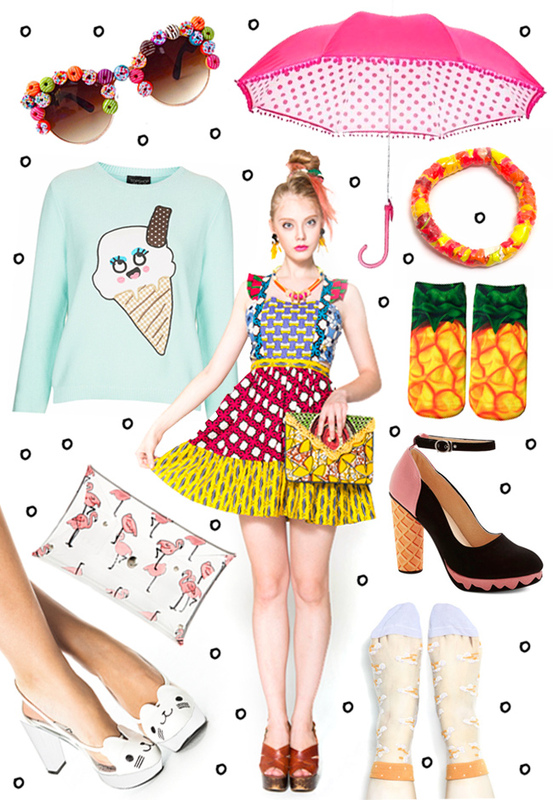 Having fun: A playful outfit puts me instantly into a cheerful mood. Reflections: Clouds in my heart shaped glasses, yay! Pizza anyone? 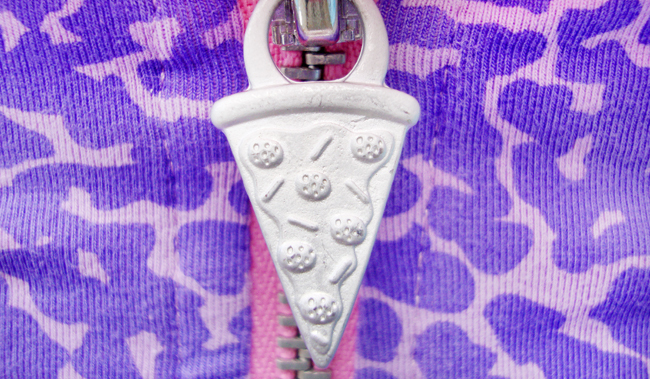 Isn't this the cutest zipper ever? 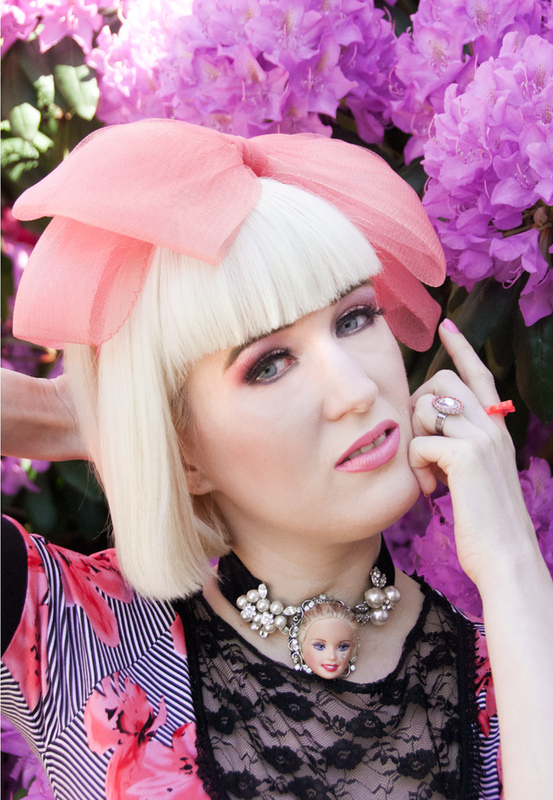 Helping hands: Cute Barbie earrings. 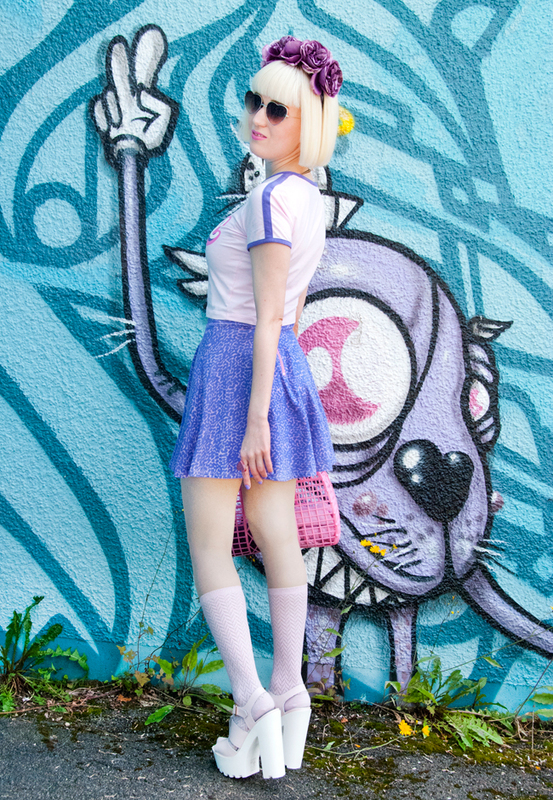 Style Rule: Always match your outfit to the prettiest graffiti in town. Why not? Kawaii: Posing like a Japanese girl and the purple fellow behind me. 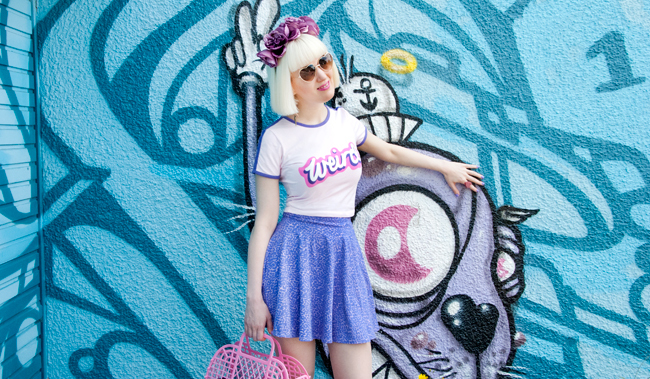 Weird Barbie: Crazy for this cute crop top from Lazy Oaf. Sweet high school: The knee-high tights makes the look even more girly. Chunky sandals: Just buy the highest you can find. Did I succeed? I've been back for almost a month and still feeling the after-London-blues so much. I just wanna run to the airport in my highest heels and board the first plane to my beloved island. How could I leave the place where all the fun is happening? Missing the creativity, the open-mindedness and excitement. With this shooting, I tried to capture a little bit of London-spirit: I was looking for the hugest graffitis I could find, reminding me a little bit of my favourite places in east London. Besides, nearly everything I wear comes from the UK. 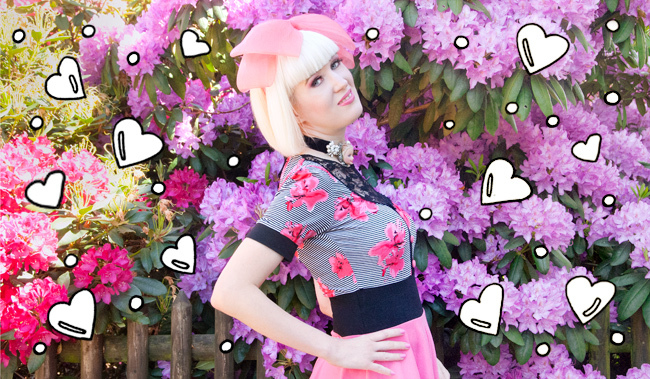 Especially for Lazy Oaf, the brand of my crop top and skirt, my love is never-ending. Sometimes I suspect their designer Gemma must be a secret spy in my fashion dreams, making one after one coming true. If you were a green alien with blinking antennas on your head you wouldn't attract more attention than going out dressed like this over here. Not all the feedback is positive, but guess what: I don't care. I agree with them – Yes I am weird, so what's the point? It's even written on my chest in Barbie-style letters, no big news. Why is being weird something negative, can't you just see it as the opposite of being ordinary and boring? Next London flight already booked. 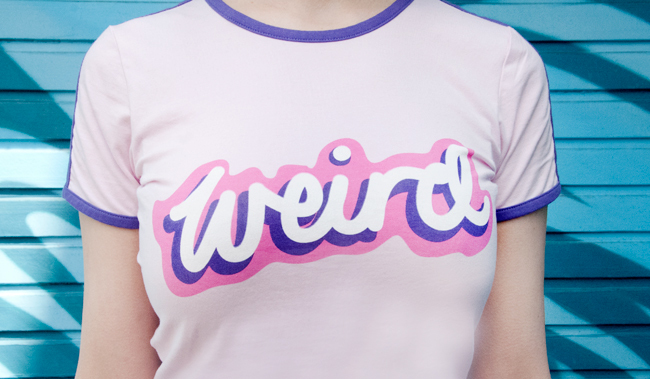 Say hello to new inspiration for how to be weird and awesome! What do you think about this look and do you have outfits that help you over bag things like homesickness? Marta: Not just a store, but a cosy place with a lot to discover. 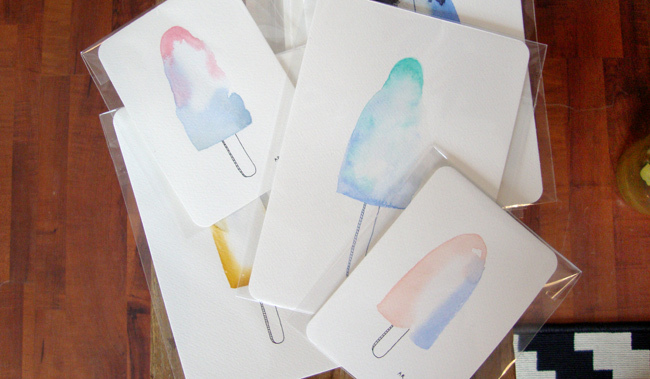 Amazing ice cream illustrations by Things by Jolla: The best thing this summer for sure! Shopping in Zurich: Boring you think? If you follow the main shopping mile you must have the impression that this city is just home of big major chains and no creative shops. But there is hope: You just have to search a little bit and you will find hidden gems. 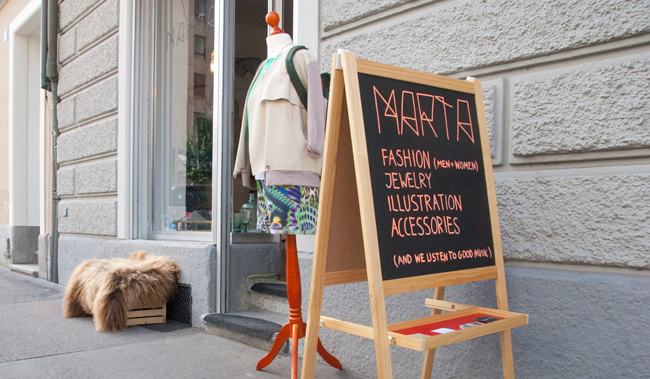 Such as Marta, a shop that opened recently and is already one of my favourite places in this city. 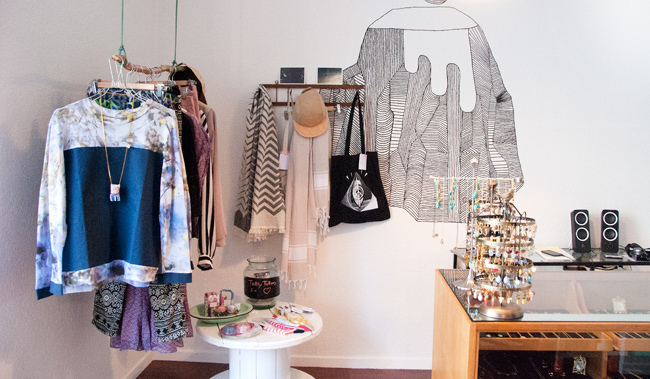 It's not just a shop, it's a place that unites fashion, home decor, art and accessories, a place run by three creative women. 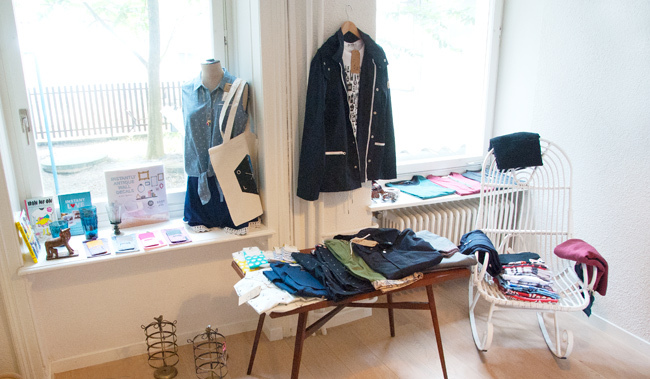 Jewellery designer NinaBee, illustrator Andrea Raemy (Things by JOLLA) and fashion designer Claudia Nabholz made their dream come true, when they opened their store together. If you enter the place, you are always greeted in a very warm way and you can really feel the passion and love of this three women for what they do. 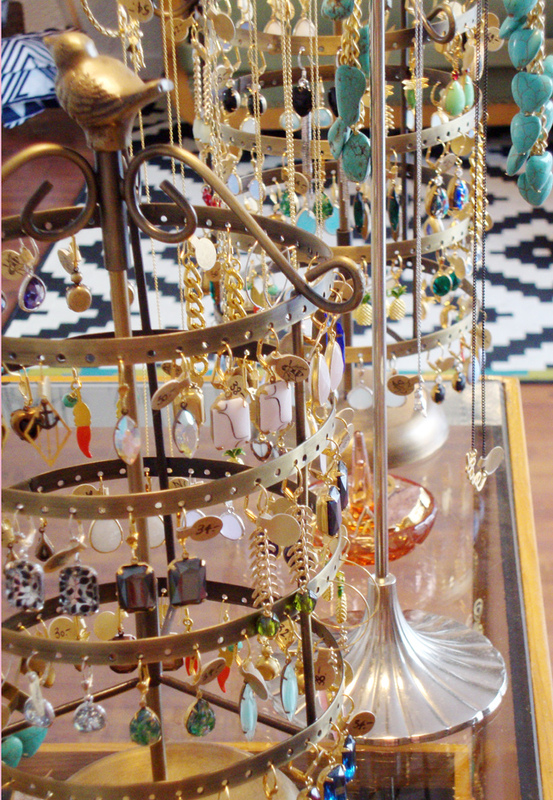 Every piece they sell is either made by them or very carefully selected. 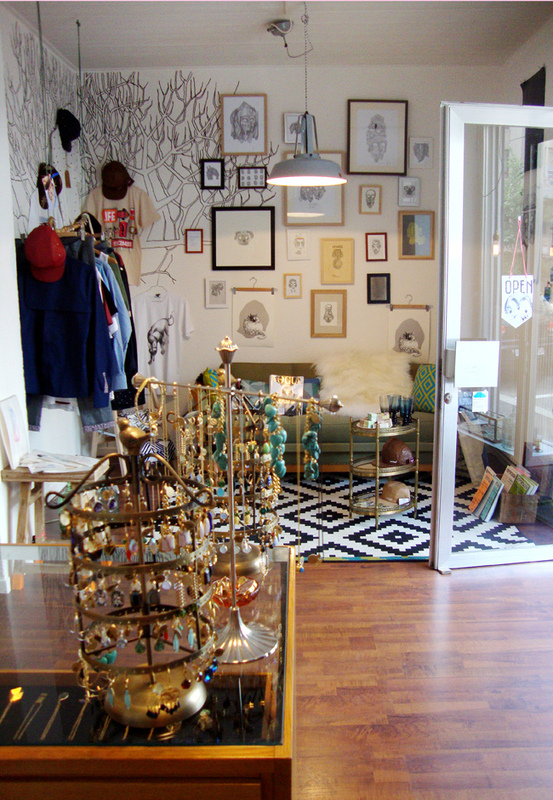 Huge hand drawn illustrations on the walls and golden tree branches used as cloth hangers are part of the decoration of the shop and make you feel like you are in an enchanted forest. 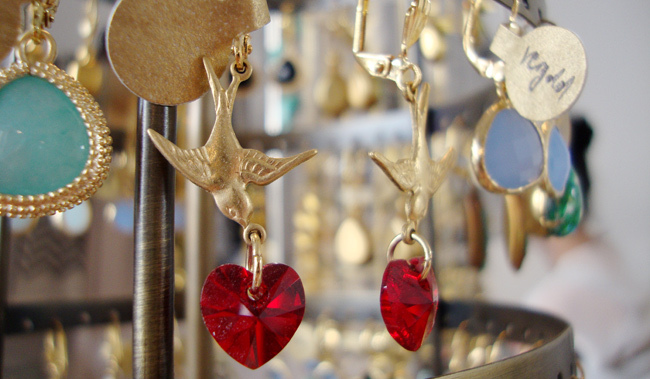 In this lovely atmosphere, it's a pleasure to shop for jewellery, pretty silk shirts, the newest summer dresses and unusual things for your home. You will leave Marta with a smile on your face, new inspiration in your heart and happily come back. Visit Marta's page here and follow them on Facebook. 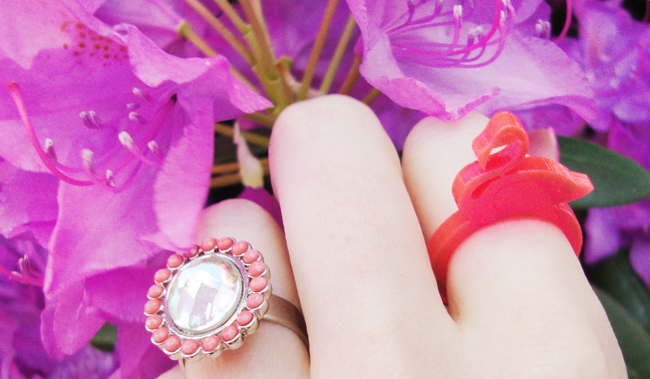 A pink flower affair is the look of the day. Wearing the biggest bow you can find is part of the look. Barbie laughs with me and enjoys the good weather as well. Pink and purple: My favourite colours. Flowers, flowers, flowers: The biggest joy in summer. 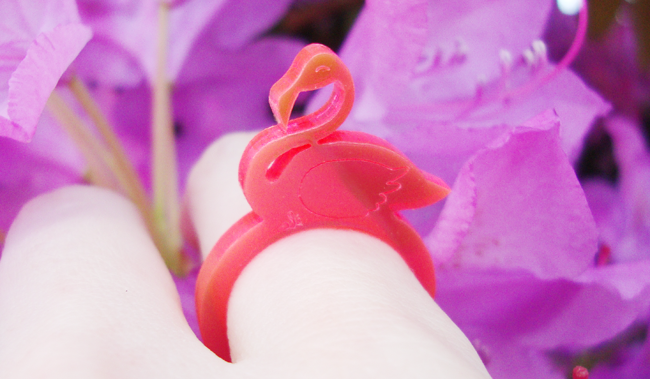 No perfect look without a flamingo, do you agree? 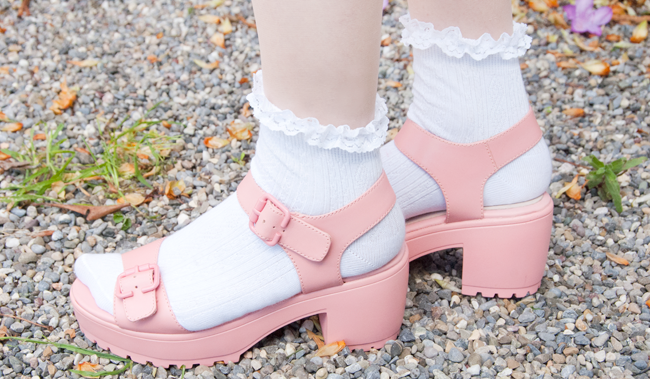 Chunky sandals and cute socks: My choice for this summer. Every spring and summer floral fantasy is back in fashion and it never ceases to amaze. There is nothing as feminine as a blooming affair from head to toe. The dress I am wearing is from the Miss Lovett SS14 collection. It's very easy to wear, comfortable and I love the material and pattern mix. Like everything I own from Miss Lovett, it just fits me perfectly. During the shooting, a cyclist mistook me for a doll and nearly fell from his bike when I moved. No sir, I'm no plastic, but your shocked face expression to learn so was truly fantastic! What do you think about this summer look lovelies? Thanks a lot to Miss Lovett for the dress. 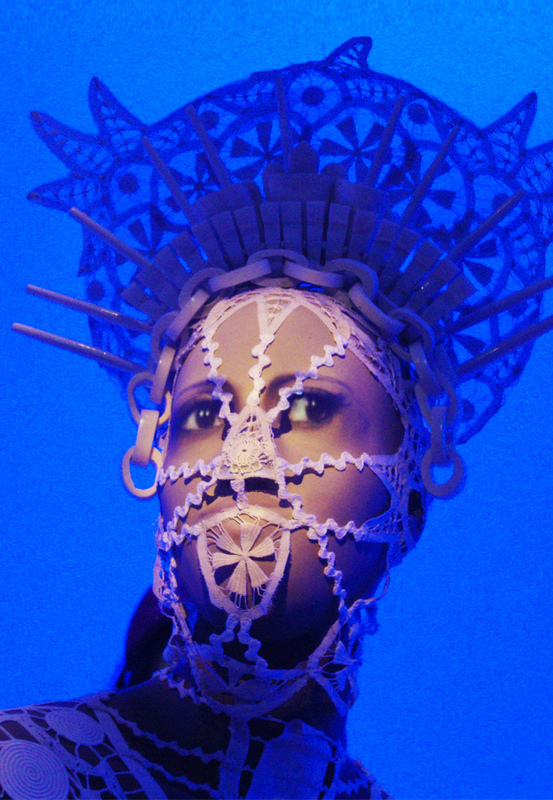 Let me tell you about a highlight of the year: The first major exhibition about French avant-garde fashion designer Jean Paul Gaultier at the Barbican Gallery in London. 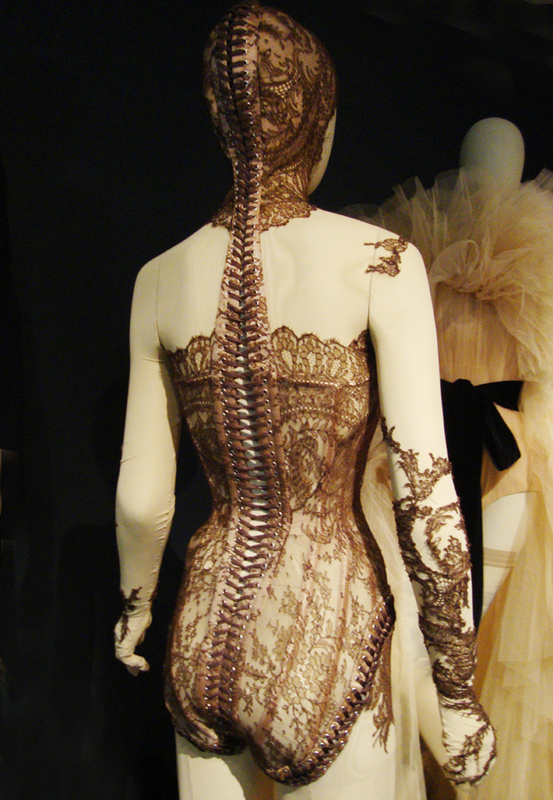 Debuting in Montreal in 2011, the exhibition has already been seen by more than a million people on it's tour and stops now in London till 25th August 2014, featuring a breathtaking amount of more than 140 fashion masterpieces. Not only the presented garments are outstanding, but the way they are shown as well: If you enter the exhibition, you are greeted by a talking mannequin of Gaultier himself with his charming French accent. You will be amazed by how alive fashion seems, worn by animated mannequins, talking, winking and even flirting with the visitors. 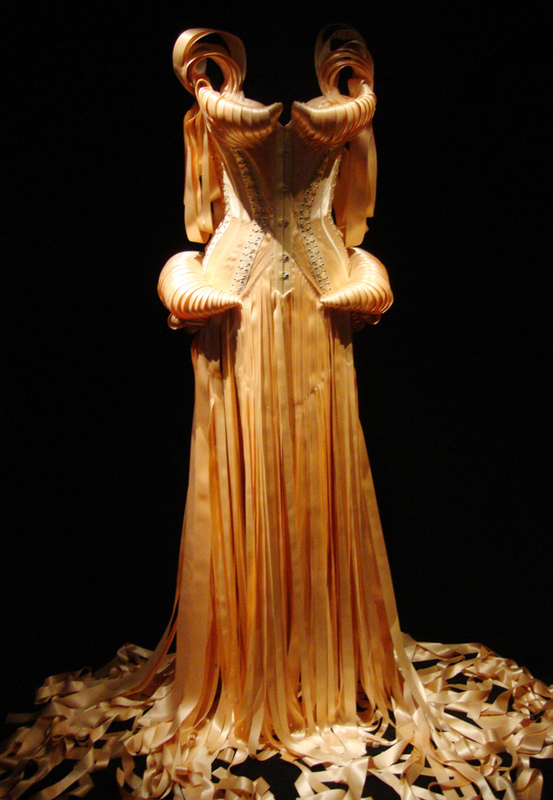 Gaultier was born 1952 in the suburbs of Paris (France) and never received a formal training as a designer. He started to sketch at an early age and became one of the most imaginative designers, shaping the world of fashion during the last 40 years. The enfant terrible of French fashion is fascinated by the idea of transgender dressing, upcycling and world coutures. 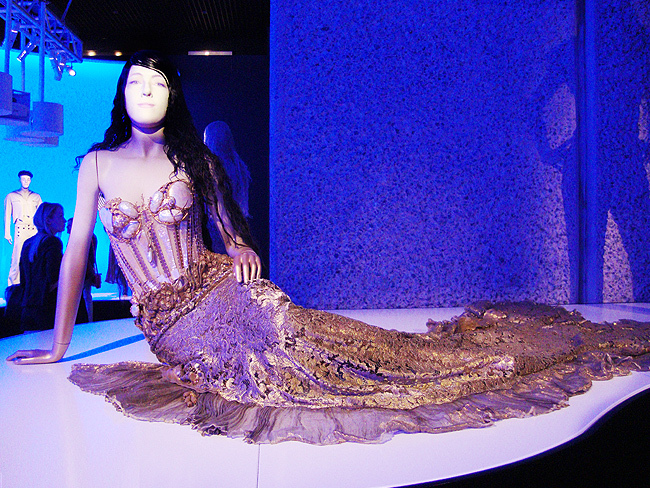 You will find his trademark corsets in the exhibition as well as maritime designs featuring mermaids and sailors, punks and madonnas, just to name a few of the milestones in the work of the witty designer. 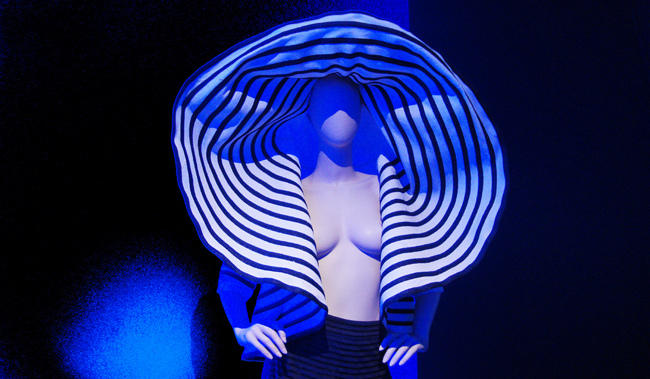 Unlike many other designers, Gaultier managed to connect his fashion with pop culture, movies and show business. 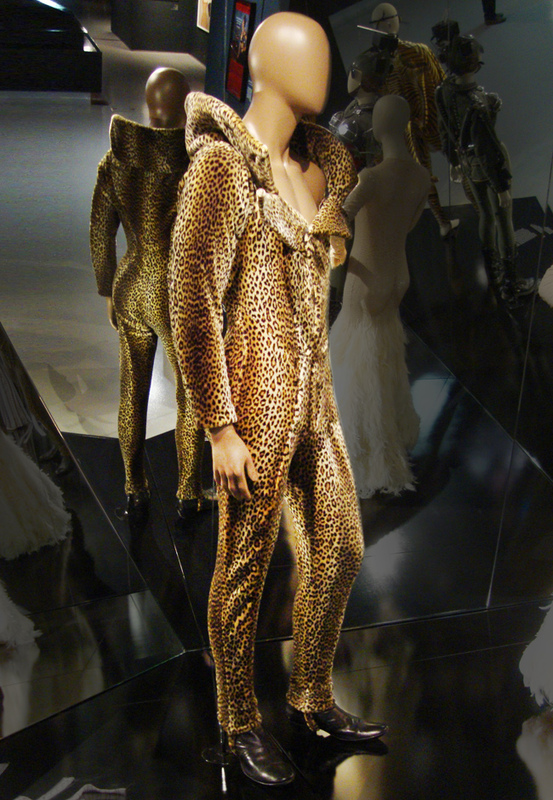 Iconic costumes for film and performance – such as the leopard costume worn by Chris Tucker in Luc Besson's "The Fifth Element", the conical bra and corsets from Madonna's Blonde Ambition tour or the black overall showcased by Grace Jones – are part of the exhibition. 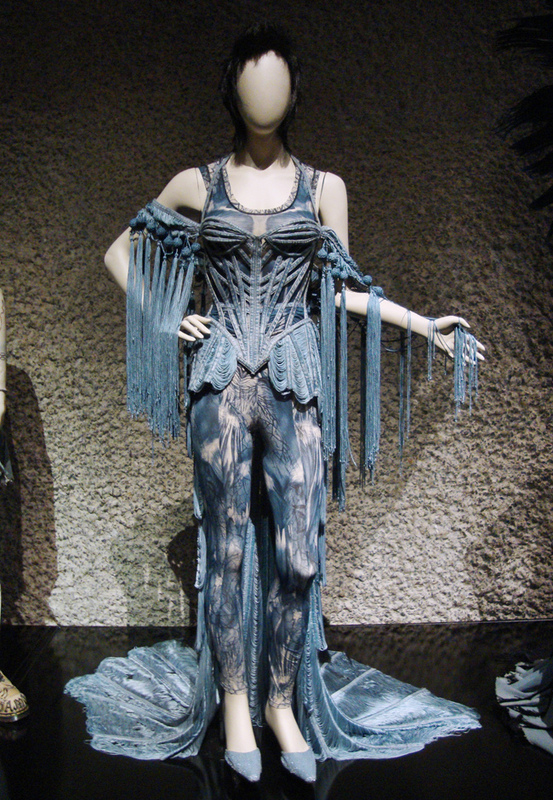 Gaultier is known for having unconventional models and muses. Neither his clothes, nor the people inspiring him are conventional. 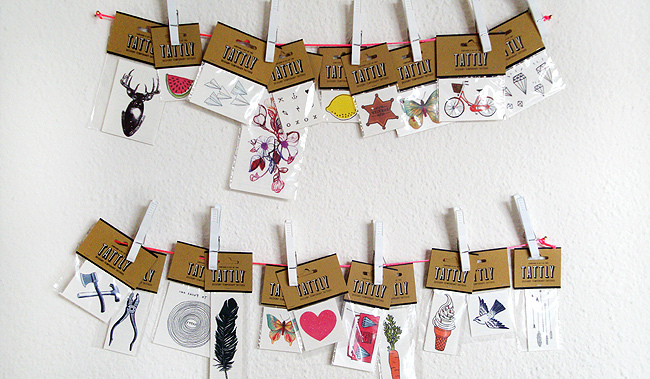 Full-figured or tattooed models has been part of many of his shows just like the play with traditional gender roles. Gaultier was as well the one who promoted the use of skirts for men. His work is controversial and never without unexpected twists, dipping from multifarious sources of inspiration. 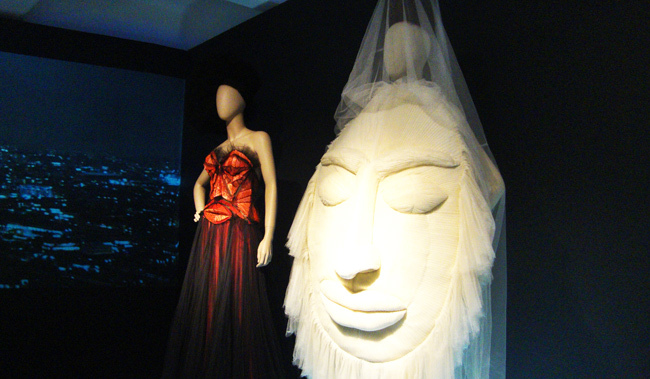 Visiting the exhibition gives you a glance into Gaultier's magnificent, bubbling imagination, definitely a must see! Visit the exhibition on a morning and plan enough time. 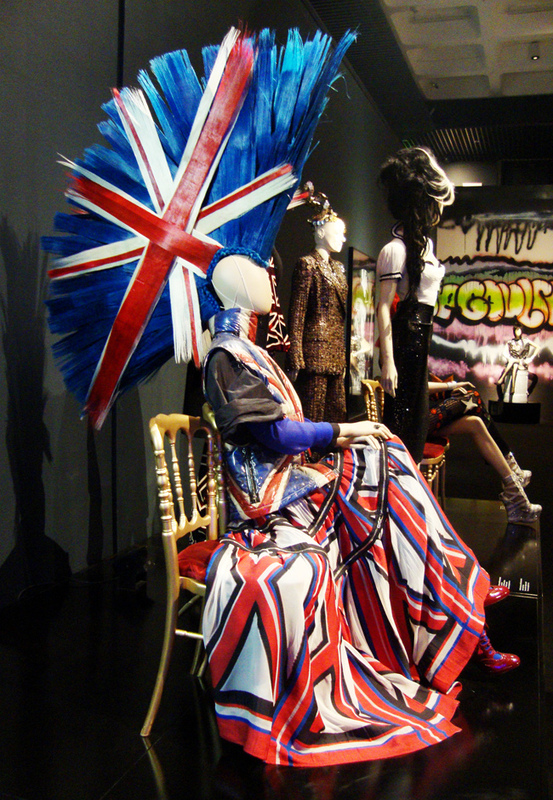 Head to Camden afterwards, to feel connected with Gaultier at a place that inspires him and he always comes back to. For more information, visit the Barbican's page. Time for another wish list! I haven't posted one for quite a while and my current one smells of summer: Bold colours, pastels, cute prints and a wild mix of patterns is all i need for my fashion summer dream. Recently, I thought a lot about how my style changed during the last years. I realized that I used to restrict myself. A lot of fashion no-go's were holding me back from experimenting, till I learned that most dont's are actually do's (if they happen on purpose and with a concept). Today I show you a collection of five don'ts that turned into do's. Hopefully they make you grin. Do you actually think that there is something as a fashion don't and did you also change your mind about something in fashion? Followers of my blog must have noticed: I am obsessed with cute socks and love to show them in my summer shoes. As a child it was all different and I was embarrassed by my dad wearing grandma's knitted socks together with sandals fit for a desert expedition. Sorry daddy: This is still a no go, but girls rock cute socks in their sandals and heels. Either you wear dots, stripes, parsley or flower patterns, but never two or even more of them together. I believed in this for a very long time until I discovered (a little bit thanks to Susie Bubble) to mix is actually the biggest challenge and creates the most thrilling looks. Sporty shoes are for sporty people and I'm the probably most unfit person in the world. The trend of Normcore might be responsible that suddenly I don't think so anymore. I am very much interested to clash elegant and sporty, casual and overdressed. Therefore I think I need sneakers for my quirky looks! The time of age restrictions in fashion is coming to an end. Thanks to forward people like Madonna changes are happening. People start to wear what makes them feel good, no matter their age. Are you already in your end 20s, 30s or 40s and still look perfectly stylish showing your midriff in a crop top? Just go for it! This is the most terrible delusion often read in magazines. It means that you can't wear the most extraordinary bags out there, because you will never find matching shoes. I believe a good styling is like a piece of music: All the components come together as a mixture between harmony and tension. You can match your shoes with your jewellery, your hair colour with your handbag or have one piece sticking out as an eye-catcher. Just play!